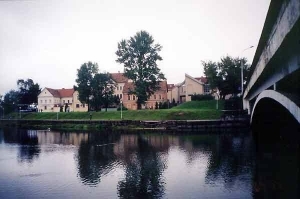 The first settlement on the left bank of the river Svisloch appeared in the 12-13th century. Historians suppose that the name of the place — Troitskoye Predmestye (Trinity suburb)– originates from a Roman-Catholic Trinity Church that was situated there. In the 14th century the Voznesensky monastery was erected on the top of the mountain. In 1620, on its site Anton Maslyanka built a stone church. In the 15–17th century Trinity suburb, Nizhny market and Rakovskoye suburb were surrounded by stone fortifications. Troitsloye Predmestye mostly consisted of wooden buildings, where the gentry lived. Troitskoye Predmestye is a birth place of the outstanding Belarusian poet Maxim Bogdanovich. Yanka Kupala's house was located here. In 1982-1985 the historical place was being carefully restored and now it is one of the most favorite place of the citizens and tourists.